It’s no secret I love sourdough! I am always trying to find new ways to use my sourdough starter in baking. Sure, I have my favourites, like these crackers, or these soft pretzels, but I’m always on the lookout for new uses. When I realized that I needed to make some more sourdough bread, I was immediately looking for a new recipe to use with my discard starter. I hate throwing any sourdough starter away, so I think it’s a good plan to have some kind of recipe rotation of discard recipes that I can whip up when I need them. This recipe was just what I needed. I had Paul peruse my Pinterest board (and I just minorly geeked out at my own alliteration… yay for being an English teacher! ), and he said that these were the first things that sounded good. Perfect! You can make these muffins with pantry staples. Also, if you are not a regular yogurt buyer, like me, just swap the yogurt out with more milk, or sour cream. I used sour cream, and added just a touch more sugar to offset the sour cream in the sourdough recipe. These muffins take no time at all to make, and you can have fresh muffins on the table in less than an hour. Win-win! Preheat the oven to 400°F. Grease and flour a 12-cup muffin tin. Set aside. Stir the sourdough starter and the sugar into the oat mixture. In a small mixing bowl, combine flour, baking powder, baking soda, and cinnamon, and salt. Whisk until combined. Stir oil and egg into the oat mixture, and combine well. Fold in dry ingredients until just mixed, then add the chocolate chips, and fold in again. Spoon batter into the prepared muffin tin. For huge muffins, evenly divide all batter into muffin cups. 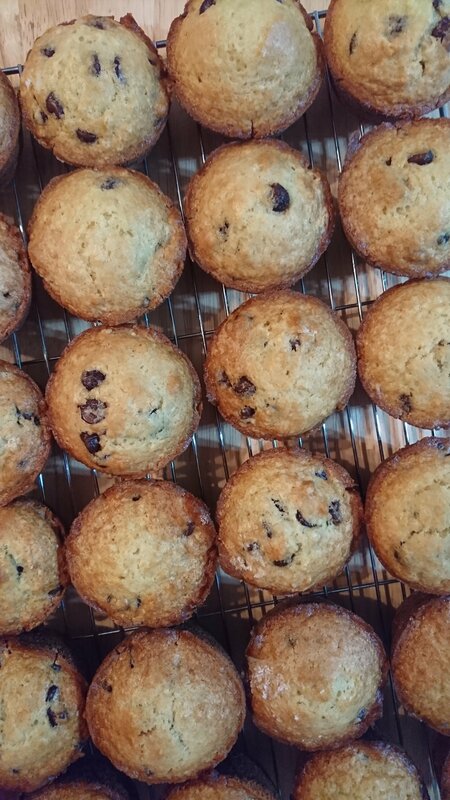 I wanted normal-sized muffins, so I spooned about ¼ cup of batter into all cups. 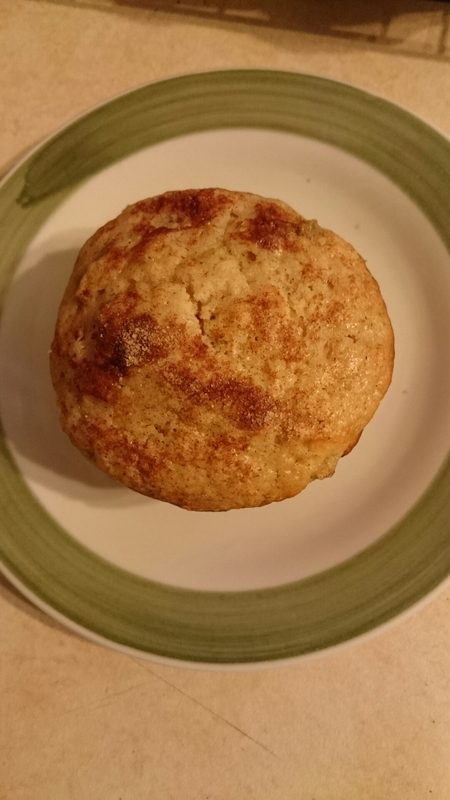 I had batter left over, (about 2 muffins worth), so I just greased a large ramekin, and made 1 jumbo muffin. Bake in the preheated oven until golden brown, about 20-25 minutes. Remove from muffin tin and cool on a wire rack. Sometimes, you just want muffins. What’s more, is that sometimes you just want chocolate chips. This recipe was the combination of both of those wants. I woke up this morning, knowing that it’s cold out and snow is on the ground, and I wanted something comforting. What’s more comforting than a chocolate chip muffin? Also, I’m a sucker for chocolate. It’s a curse, I know. I found this recipe here, and I followed the recipe to a T. Not going to lie, I shouldn’t have. The recipe says that it yields 12 muffins. However, maybe the original author has a magic deep muffin pan with large spaces, because my twelve muffins baked together. A lot. I was a little sad, and if I make them again (which I’m sure I will because although they didn’t look nice, they tasted divine) I’m definitely going to put less batter in each muffin cup. I think you could actually get two dozen muffins instead of just one dozen if you proportion the batter properly. Oh well, live and learn. To be honest, these pictures are from the second go-round making these muffins. I was so displeased with the look of the first batch that I refused to add a picture from that batch, but be confident that I also make mistakes in my kitchen! These muffins were still delicious. They were fluffy, soft, and perfectly moist (and very gooey when still warm!). They were also extremely easy to make, and are made with pantry staples (if you are like me and consider chocolate chips a pantry staple). 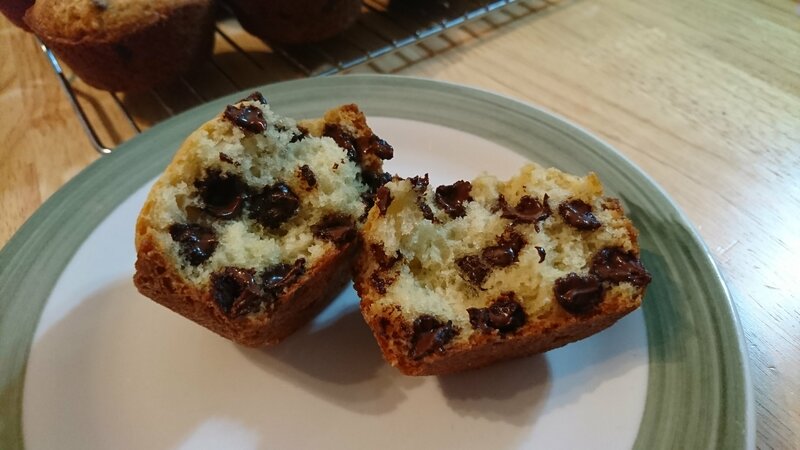 These muffins are able to be whipped up in no time, and satisfy all cravings of a chocolate chip lover, as well as a muffin lover. Enjoy them! Preheat oven to 425°F. Line a muffin tin with paper liners, spray with cooking spray, or brush with cake release. Set aside. In a large bowl, whisk together the flour, baking powder, baking soda, salt, and chocolate chips. Set aside. In a medium bowl, combine the butter, sugar, eggs, milk, and vanilla. Whisk until combined. Add the wet ingredients to the dry ingredients, and fold together. Scoop batter into prepared muffin tins (again, use large scoops of batter for large muffins, and smaller scoops of batter for smaller muffins). Bake in preheated oven for 5 minutes. After the first five minutes, reduce the oven temperature to 375°F, and bake for an additional 12-15 minutes, or until a toothpick inserted into the tops of the muffins comes out clean. Like I said with my last post, muffin kick. You all know my tea addiction as well. I couldn’t resist. 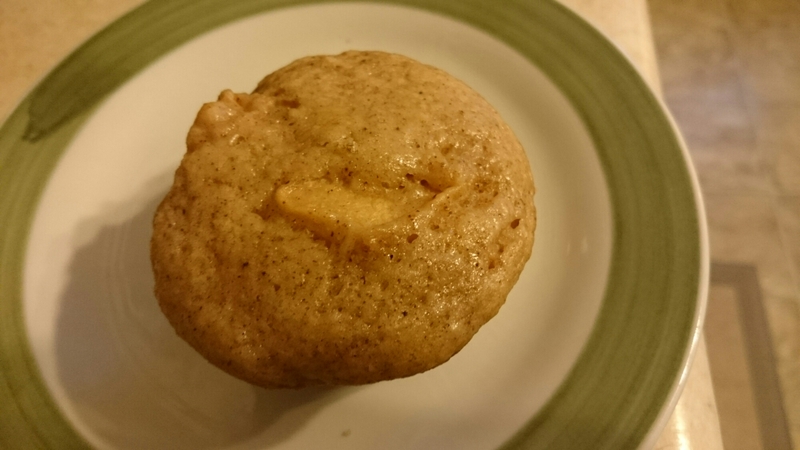 I saw these Apple Chai Muffins and just had to try them. Now, the original recipe, found here, is a bit more complex. 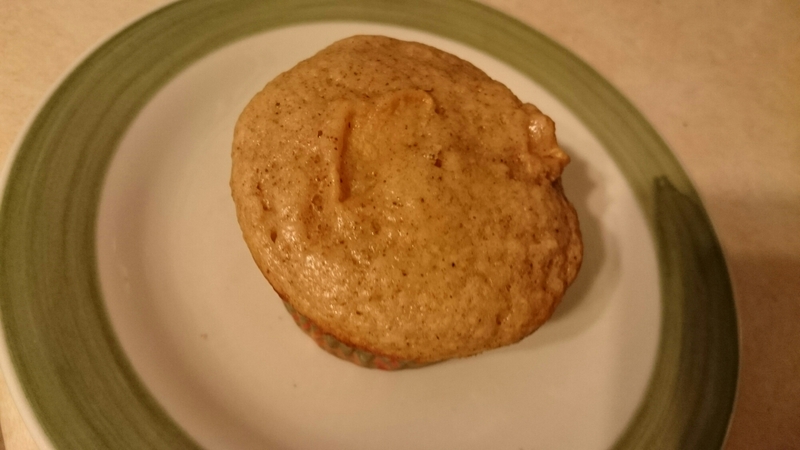 I usually follow all the steps and components to a recipe, but I just wanted a simple muffin. 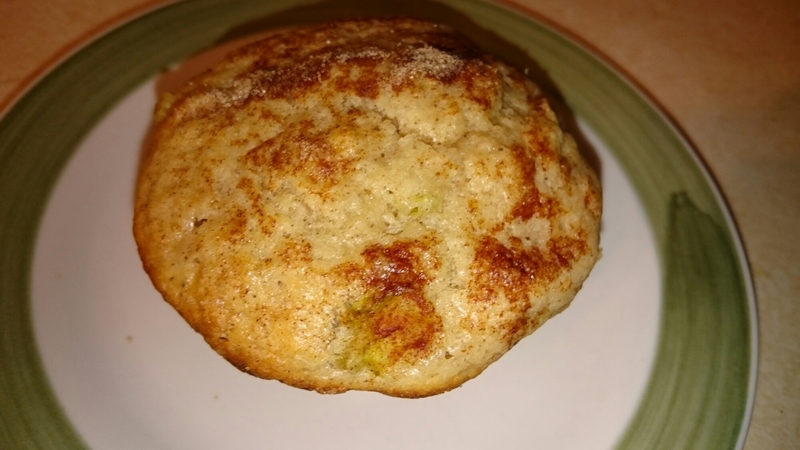 The original recipe also had a streusel topping, and a chai glaze, but I was content with just a muffin without all the pomp and circumstance. I took just the muffin recipe. If you would like to add the streusel and the chai glaze, head on over to the original recipe’s website. 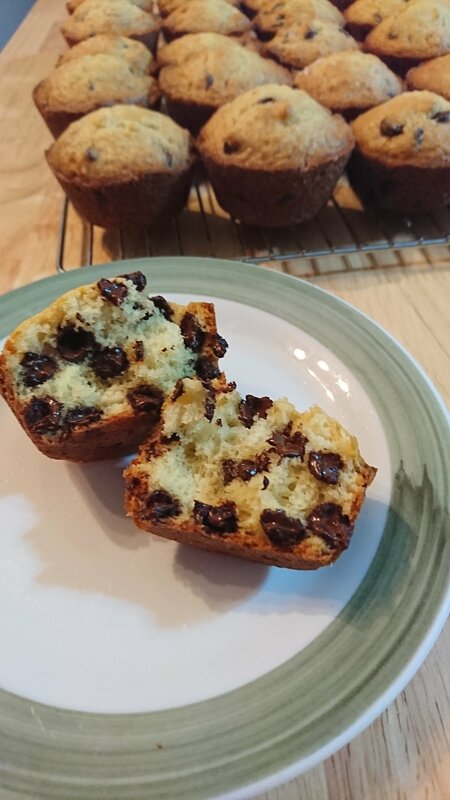 I also wanted to make smaller muffins this time, so I put less batter in each muffin cup, and was able to get two dozen muffins. I was also wanting more apples in my muffins, so I doubled the amount of apples, and this is reflected in the recipe that I have written. I also realized that there is no actual chai in the muffins. If you wanted to, you could omit the spices, and substitute about 2 tea bags of your favourite chai tea. Preheat the oven to 400°F. Line two muffin trays with paper liners. In a large mixing bowl, combine the flour, sugar, baking powder, baking soda, salt and spices. Whisk together. In a medium mixing bowl, whisk together the eggs, sour cream, butter and vanilla. With a spatula, fold in the wet ingredients into the dry ingredients. Be careful not to over-mix. Fold in the apples. Spoon batter into the muffin cups until they are about two-thirds full. Bake for 18-22 minutes, until a toothpick inserted into the centre of the muffin comes out clean. I am on a muffin kick right now. With how much substitute teaching I’ve been doing, I need some snacks that I can quickly pack and take to lunch if I get a call early in the morning. I also need something that will fill me up, and muffins, especially muffins with fruit in them, are one of the top contenders. I had some rhubarb in the freezer left over from my farmer’s market finds in the summer, and when I stumbled upon this recipe, I was extremely excited. Preheat oven to 400°F. Line a muffin tin with paper liners and set aside. In a large mixing bowl, blend the flour, sugar, baking powder, baking soda, salt and cinnamon together. In a separate bowl, whisk together the sour cream, butter, eggs, and vanilla. Fold in the wet ingredients into the dry ingredients, being careful not to over-mix. Gently fold in the rhubarb with a spatula. Spoon into muffin liners. Fill full and slightly mounded for larger muffins, fill about two-thirds full for smaller muffins. Whisk together sugar and cinnamon and sprinkle over the tops of the muffins. Bake for 18-22 minutes, until a toothpick inserted in the centre of the muffins comes out clean. Let cool in pans 5-10 minutes before transferring to a wire rack. Serve warm.